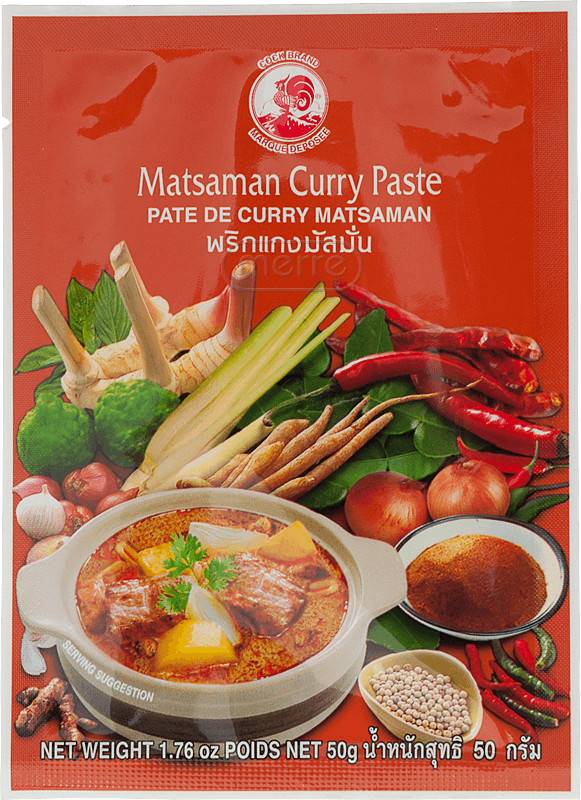 Curry masaman is the most complex and needs the most time to prepare from all Thai curries. It is also the tastiest curry. This type of curry came to Thai cuisine relatively late. It is believed that the recipe was brought by the first Persian minister to the royal court in Ayuthyia in the sixteenth century. The dish has been fully adapted to Thai cuisine, is characterized by oiliness as well as sweet and sour taste due to the large amount of tamarind and sugar. In 2011, CNN Go placed the curry Massaman in the firt position in the World's 50 most delicious foods rank. Preparation: (for 2 - 3 poeple): Stir the content of the Massaman Curry paste with 3 tablespoons of vegetable oil, and gentle heat for while. Add 150g of your well cut favourite meat and 500 ml of coconut milk, 3 tablespoons of palm sugar, 1 tablespoon of fish sauce, 1 tablespoon of tamarind paste or as prefered. Add well cut onion, potatoes (cube shaped) and roasted peanuts. Simmer on medium heat until all ingredients are cooked. Serve with steamed rice.